Country Chic Paint sponsored this post however, I LOVE their Pocket Watch metallic cream so much that I would share regardless! Please read my disclosure policy. 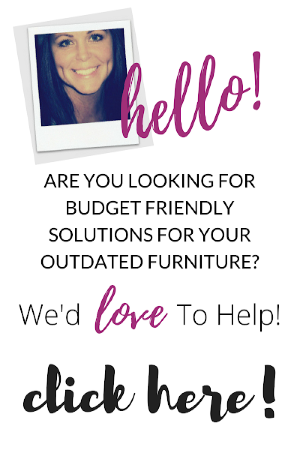 Do you have a bare wall that's been staring back at you? Have you been dreaming of pulling it together to create a gallery wall but you're not sure how to turn that dream into a realty? - It's hard to visualize the layout. You're unsure about the pictures you might want to use? - Do you think a gallery wall will cost a lot of money? 3.) 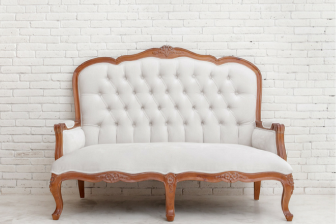 Feel Like YOU Have The Tools & Resources To Start And FINISH Your Beloved Gallery Wall. I want you to slay it. Conquer it. And check it off your list! No more regrets. No more putting it off. (Do you hear the theme from Rocky playing in your background?) Well it is, CHAMP! 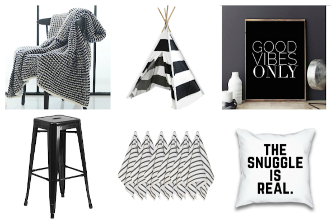 Here's how YOU are going to pull off your gallery wall in one week! - Take a good hard look at your space. Eyeball it. Where do you want the edges of your gallery wall to start and end? Decide, then place light, short pencil marks on the top, bottom, and sides of your designated gallery area. - Measure out your rough pencil marks with your measuring tape and write down those dimensions. For simplicity purposes, feel free to round up or down to your nearest even whole number. - If you're unsure of what you want your gallery wall to look like or if you're having a hard time visualizing the layout take that stresser out of the equation! You don't have to come up with the look and feel all by yourself. There are lots of places where you can find inspiration for your gallery walls. Take a peak Gallery Wall Pinterest Board below and get started. - Take a look around your house. 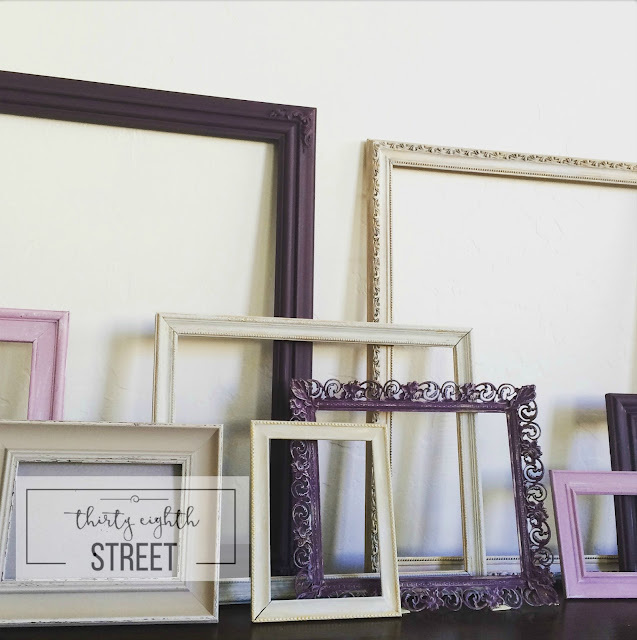 Are you hoarding any pictures frames that aren't being used or that you'd like to re-cycle for another space? - Garage sales is another awesome place to find picture frames for dimes, quarters, and a few dollars depending on the size. Offer a certain price to purchase in bulk. Most sellers are just eager to get them out of their garage. - If you selected an eclectic gallery layout, you'll want to choose frames that are in a variety of sizes and shapes and thickness. - How do you know if you have enough frames? 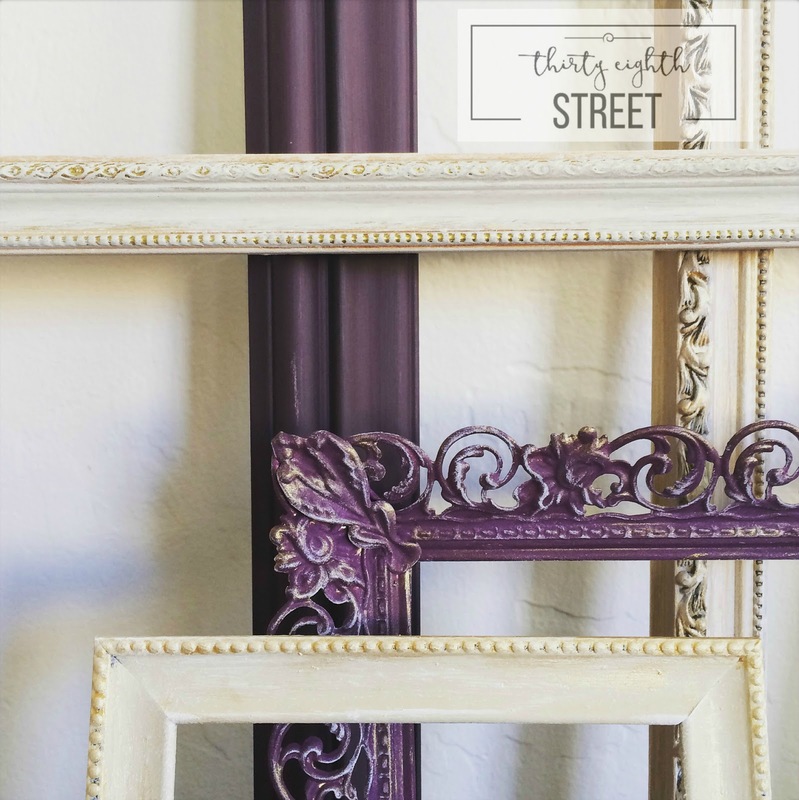 Lay your frames on the floor and arrange them like your inspiration photos. Place spaces in between the frames. Does it fill the space of your measurements from Day One? If not, you may need a few more. Look at the progress you've made! You've figured out the style and color scheme of your gallery wall. Check! You have bargained shopped and raided your own home for old and unused frames. Check! Check! Now comes the fun part! 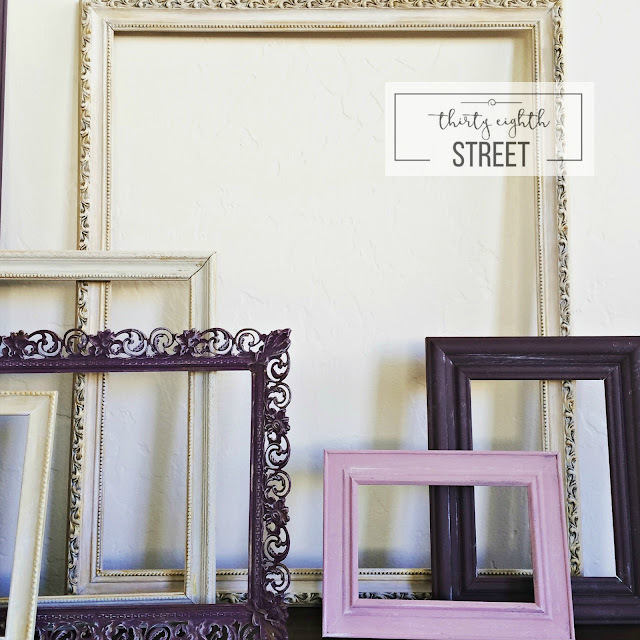 Painting your frames is an easy and inexpensive way to get a custom color pallet that works for your space. 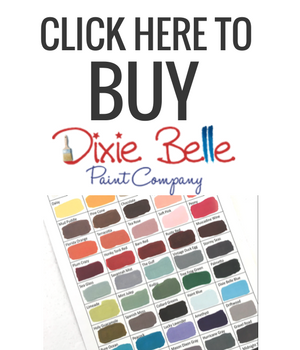 If you choose to use Country Chic Paint, you can paint right onto any plastic, metal, wood- it doesn't matter! No prep needed. 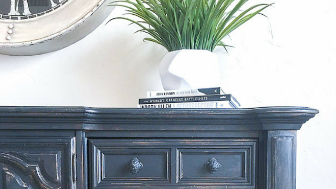 CCP's Furniture & Home Decor Paint will stick to just about any picture frame surface. Remove all the glass and set them aside. Put on some music or a show and paint away! It should go by quick and easy! For this collection, we used Country Chic Decor Paint in the colors: Perfection, Perfection + Vanilla Frosting, Harmony and Cheesecake. We added a touch of bling bling to some of the frame details by applying Country Chic Paint's metallic cream in Pocket Watch. We demonstrated our technique for applying CCP's metallic cream here in our "Bling Bling!" Country Chic Metallic Cream post. Here are a few more pictures frames that we painted as a collection. Choose the pictures and sizes for your frames. Send them off to a store of your choice. Most drug store companies or Costco can have them printed within a few hours and really inexpensively. You are nearly there! Put on a movie for this next step! It's not difficult. 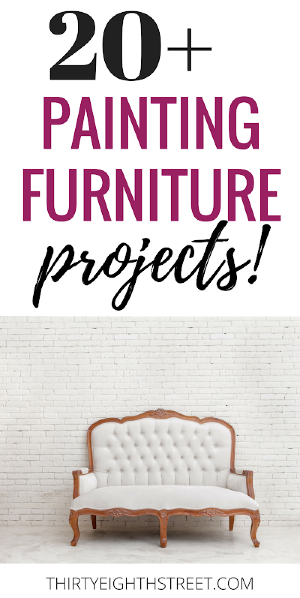 If you can trace and cut, you've got this! 1. Roll out a piece of brown kraft paper to the dimensions of your overall gallery wall that you took on Day One. 2. 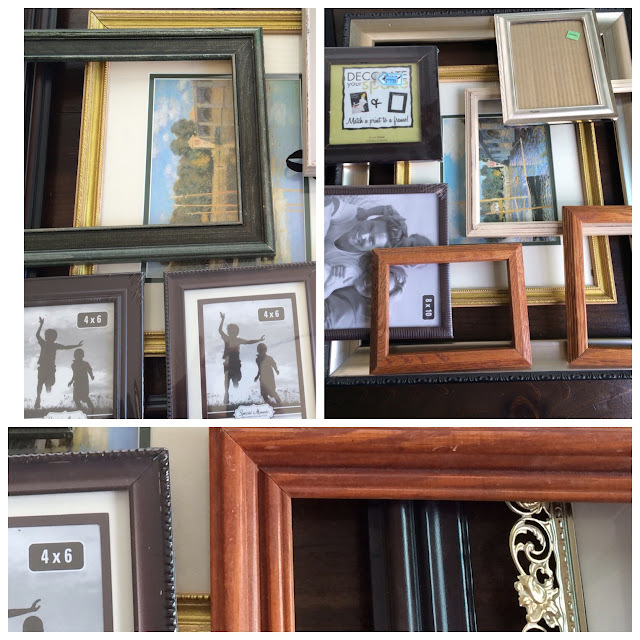 Arrange your frames on top of the kraft paper. Use your inspiration photos as your guide. Mirror your frames onto your kraft paper like you see them in your inspiration photo(s). 3.Once you have them arranged like you like them, trace around each frame. Leave your frame in place after you trace. This helps you keep a visual placement for wall placement in a little bit. 4. Cut out each traced frame but leave the paper underneath it's frame as it was arranged. 5. Have all of your pieces cut? Fabulous! Starting with your center frame, take your traced piece of paper from under the fame and center it onto your gallery wall, then tape it into place. Move out from the center and grab your next traced paper. Space it accordingly to your floor template and tape that one to the wall. Continue to tape up your paper pieces while still leaving your frames in place on the floor. This will help give you have a visual on placement as you tape up your pieces. 6. Once all of your pieces are taped in place to the wall, stand back and adjust them until you have it just the way you want it. Secure a nail or picture hanging hardware onto each paper. Than, place your pictures into place. Stand back and take a look. Does everything look as it should? Then, remove your kraft paper from behind your frames and treat yourself to something! You deserve it! Are you looking to add texture, interest into your gallery wall? 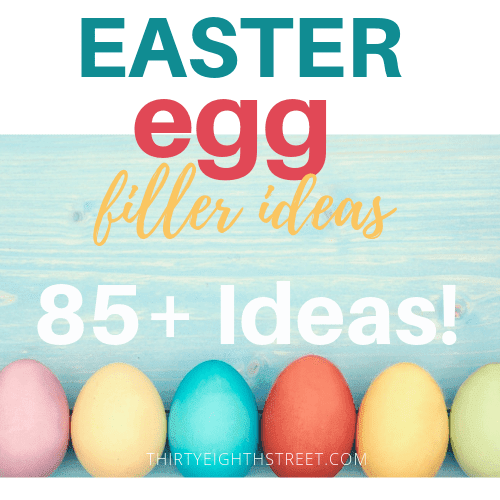 Here are a few ideas ! -Add a fun clock into the mix. If you haven't started, do it! If you're thinking about doing it, stop thinking and do it! It will feel good to have it completed and checked off! 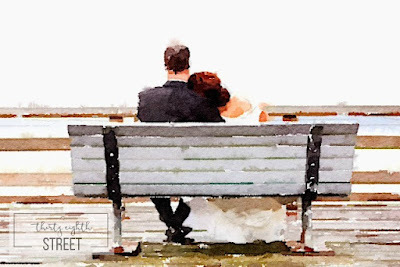 If you enjoyed this post, you'll love our post on How To Create Sentimental Art. Thank you for the post! Really helpful! Olga, I'm glad it was helpful! Great tips for putting together a gallery wall. Thank you for sharing with us at Vintage Charm. I'm glad you liked it, Kerryanne! Have a great weekend! I've never dared to put together a gallery wall so thank you so much for the tips and for sharing with us at Sweet Inspiration party! Enjoy the rest of the week! Ah, thank you! I hope you'll jump in with both feet and go for it, Pili! I actually did my first large gallery wall last year and changed it up a bit. These are great tips for anyone looking to do one. Thanks for sharing on Merry Monday. Yay!.. you've checked that one off of your list! :) I'm glad you found this helpful!